Egg Boy is a true hero of our time, and deserves to be celebrated in every possible way. Anybody with a heart was left sickened by the vile comments made by Australian politician Fraser Anning following the Christchurch terrorist massacre. Showing an inhumane lack of sympathy, the independent Queensland senator placed the blame on a ‘growing fear over an increasing Muslim presence’. This shocking opinion came at a moment when many Muslim families had just begun to grieve for loved ones shot dead at their place of worship. With fury, many people took to Twitter to quite rightly condemn Anning. But how many of would actually have the brass cahoonies to march up to him mid-speech and crack a head on his head? Enter Egg Boy – real name Will Connolly – a 17-year-old boy who has just shown how young people don’t have to put up with being fed hate from those who are old enough to know better. His brave act – which resulted in him being punched by Anning and held in headlock by some members of Anning’s team – has led to his emergence as a cult hero. In a week where it would have been easy to collapse with despair, Will and his single egg became a much needed symbol of defiance. 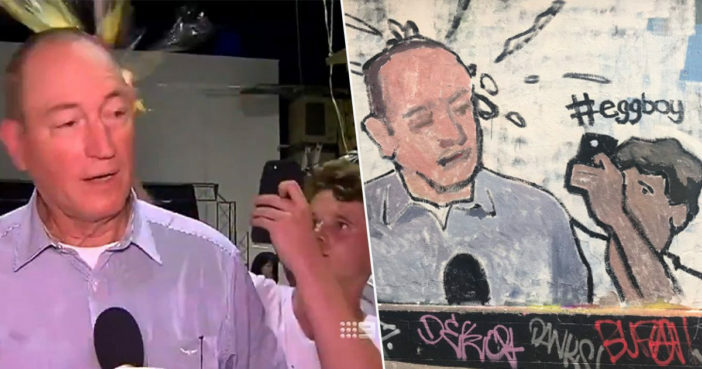 And now the Victoria teen is being honored with a mural which depicts the glorious moment the egg met with Anning’s head, yoke spattering like an eggy firework. The mural has been painted at Melbourne’s Hosier Lane, a well-known spot in the Aussie city for street art. The artist is believed to be Van T Rudd, nephew of former Prime Minister Kevin Rudd and regular creative contributor at the tourist hot-spot. If you’re on your way to work in Melbourne CBD this morning, here’s a gift for you in Hosier Lane. This mural just HAD to be done! A tribute to #eggboy and his glorious response to Australian politician #fraseranning ‘s support of extreme right wing terror. Don’t forget the protest against right wing extremism in Melbourne this Tuesday, 5.30pm too!! Solidarity with Muslims, refugees, migrants! A GoFundMe page was set up to support Egg Boy, with donations going towards covering his legal fees and, of course, ‘more eggs’. Proof of contact with EggBoi can be seen in updates and has been verified by other people too. Cracking stuff. Stay gold, Egg Boy.